Where do you holiday with your husband, 82 year old mother, three teenagers and a dog? A challenge, you’ll agree. Forest Holidays’ log cabins in woods managed by the Forestry Commission promised the mix of peace and tranquillity, energetic activity and poor mobile reception that we were after. Surprisingly, persuading the children to book a cabin in the Forest of Dean wasn’t that hard. 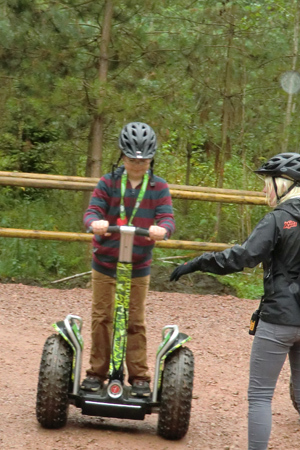 The thought of "Go Ape", segways, canoeing and wi-fi in the cabin was enough of a lure. From horse riding to archery, the choice of things to do outdoors was huge. Indoors, there were even swankie treats such as spa treatments and chef-cooked meals in your own cabin if you were so inclined. So we prebooked the activities and off we went. The cabin itself was pretty and comfortable, affording views of mature trees all around. Meals on the veranda surrounded by the tallest oaks were superb. We also made a few trips to nearby towns and saw landmarks like the fort of Symonds Yat Rock. Every day we did something new and exciting. 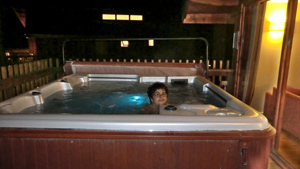 And to rest, the hot tub Jacuzi outside our Silver Birch cabin was a favourite with all. Until we realised that we hadn’t quite explored all the attractions ... like the woods, for instance. Hard to miss the woods, as the cabins are perched on the edge of a vast enchanting ancient forest, offering footpaths, rest points and stunning views. Taking everyone for a walk into the woods was hard work, really hard word. First of all, information from Forest Holidays reception wasn’t forthcoming. Yes, they produced a map, but couldn’t tell us anything else. It was more a “walk at your own peril” approach rather than an introduction to the charms of the woods. Funny, comparing their marketing effort for all the adventures which had brought our children to the forest in the first place. Only the dog was a happy explorer. After two hours, our teenagers turned around, heading for the cabin to watch a blockbuster. (Yes, I know, I shouldn’t have booked the “film package”). Determined, my husband and I walked for much longer, even to the point where we thought we might not be able to find the way back. But this was our last day of holiday, so knew we wouldn’t have another chance. Small Woods Association – a nunnery or a hothouse? Why did we go down to the woods today?